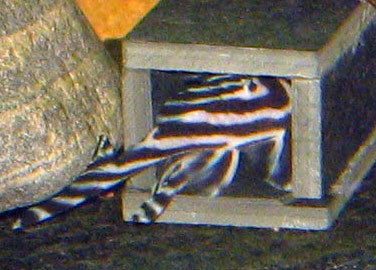 The Zebra will tolerate a rather wide range of water parameters, GH should be >5, PH 6 - 7,5 and temperature 26 - 30°C. The fish lives in a fast flowing river with high concentration of dissolved oxygen. A dissolved oxygen level of >8 is ideal, but not easy to achieve as they want such high temperature. The tank should be decorated with sand as substrate, as they dig and "clean" quite a lot outside of their caves. Coarse gravel will not be gentle on their stomach, which is why I prefer fine sand. They need lots of rocks and caves, slate tile is easy to use if you want to mimic their natural habitat, which has lots of crevices to allow them to hide and form territories. I include plants as part of the decoration, this is not necessary but the fish eat remnants of plants as a vegetable supplement to their mainly carnivorous diet. This fish does not eat algae! They live on debts of up to 30m, and there aren't many algae down there, so it's quite natural that this fish is not an efficient algae eater. I have personally seen them attack a small snail before grazing algae! Tetra Discus, frozen live food, or - their favorite - frozen home made shrimp and veggie mix, are examples of suitable food. They can also eat pellets and flake food, but I personally don't give them this, not because it's not good enough, but simply because I have better alternatives available. Just bear in mind that the Zebra should be given primarily a protein based diet. Contrary to popular belief, the Zebra occasionally does eat bogwood. The picture shows a piece of bogwood from a species only tank. They live in a strong current in their natural habitat. A tank turnover of minimum 6 is recommended, but some breeders keep them in as much as 30. I have 6 in my tanks, but use a diffuser to make sure the dissolved oxygen level is kept high. My personal opinion is that the strong current is not as important as the dissolved oxygen level, but opinions will differ on this matter. They do not need a very large tank, as the maximum length of this fish is around 10 cm. In my experience a 120L tank is suitable for six to eight adult Zebras, as long as plenty of caves and hiding places are provide to enable the fish to form territories. 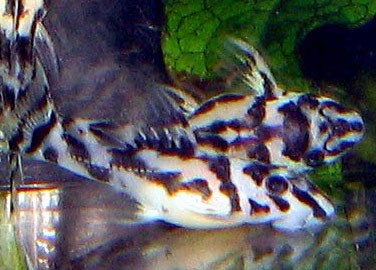 They can be kept together with other fish, this is a peaceful fish that will only have disputes with their own kind, but if breeding is desired a species tank is - if not necessary - recommended. The Zebra Pl*co is not good at competing for food, which should be kept in mind if it's kept together with other bottom dwellers. Other fish will have to like a high temperature and strong current, and preferably not be energetic swimmers that never keep still type fish. It's not easy to determine the gender of the Zebra, but it can be done. The fish does need to be sexually mature before it can be identified with some certainty though, and it's important not to look at only one sign, as individual differences can have you easily fooled. A female can display one characteristic typical for a male, and vice versa, but can be a dead giveaway based on another characteristic. Nr1 shows the "normal" body shape of a male. 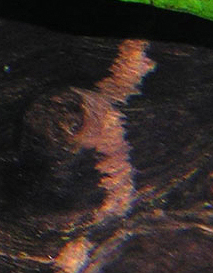 Nr2 shows the "normal" body shape of a female. Nr3 shows a chubby male. You can see that body shape can not be trusted by itself to identify the gender, but might give a pointer, together with the other characteristics described here. 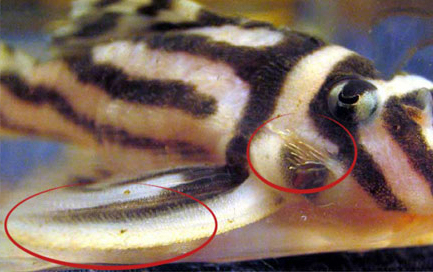 Both females and males will have odontodal growth - "hair" or "spikes"), mainly on their pectoral fin, and between the gills. If seen from above, the female very rarely has interopercular growth that extends past where the pectoral fin begins. But when seen from above it's obvious that the interopercular odontodes are a lot shorter than those of the male. The female has a slightly more crescent shaped pectoral fin than the male. Some people can take one look at the pectoral fin and immediately know if it's a male or female. I have never been able to do so, and prefer to look at the pelvic fin. 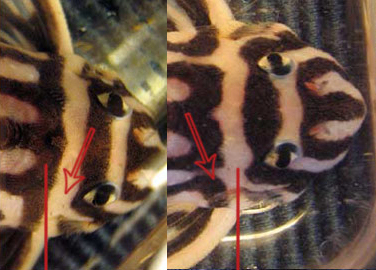 The male has a larger pelvic fin than the female. This is also the one sign that has an explanation based on the fish's behaviour. The male will use his pelvic fins to keep the cave clean, and to "fan" the eggs when guarding them. It seems to me a natural consequence that his pelvic fin is larger than the females, as he actually uses them for something important. Opinions differ on this though. The first ray of the pectoral fin is also thicker on the male than that of a female. All the pictures shown here is of a dominant male and a female. Younger specimens is sometimes easier identified by behavior rather than physical appearance. A younger male will take possession of a cave and will often be reluctant to leave the cave for any length of time, whereas a female will prefer to hide under rocks and bogwood, move around the tank more, and often change her preferred hiding spot. There's usually no problem identifying a dominant male, the problem is telling a female and a subdominant male apart, as the characteristics aren't as developed in a subdominant male. He can therefore easily be mistaken for a female. But by using a combination of the characteristics described here it is still possible to tell the genders apart, in most cases, and experience makes the guessing more accurate! I say guessing, because unfortunately there is still en element of guessing involved, that is until the fish is identified through spawning, then one knows for sure. 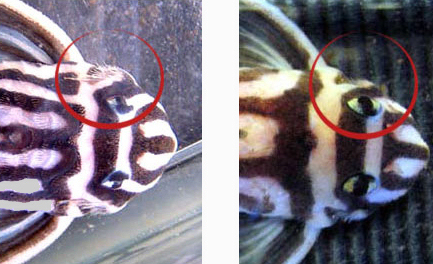 Once the fish's gender is identified then you want to breed them right? The Zebra is not hard to breed. It's getting the group to spawn for the first time that is hard! Once that first spawn is done, then they'll need very little encouragement to start the next. And they'll probably give years of joy to the owner in the form of little tiny Zebras too! I personally know of a breeding group that has been productive for 10 years, and they still are. There are reports of 15 year old Zebras still being productive too, without me personally being able to verify this. A small group can consist of 1 male and 3 female. In order to breed the Zebra, it's necessary to make them believe that there's been a rainy season. So lets look at what happens to the water after a rainy season; the current gets higher, it gets colder, the hardness drops, and the PH drops. To simulate these conditions, try heavy water changes every day for a week, making sure the water is a bit colder than they are used to - they should be used to 29C, the water temp can drop to 24C), more acidic than they are used to - they should be used to about 7, drop it to about 6), and softer than they are used to. Most people use RO water for this procedure, personally I do not, but it is recommended. Add an extra power head, and then remove it after a week or two. Some people get their camera out and flash the tank to simulate lightning during this procedure as well, and they have managed to get their group started! I never did that myself, but who knows, maybe it will help. The point being - make them think the rainy season has just ended, and they will spawn. After that first spawn a normal water change might be all that triggers the next, so it gets easier, if you got disheartened by all the work involved in the procedure described above Only one male will be the alpha male in a group, and he will be the only one allowed to breed. If a subdominant male should be lucky enough to get a female visitor, and spawn, the alpha male will do everything he can to sabotage successful rearing of the clutch. The alpha male can achieve this in a number of ways, but one method reported is the sub dominant male being trapped inside the cave by the alpha male, which stresses the sub dominant enough to loose control over the egg clutch so they fall out, or he ends up eating them. Once they are ready to spawn, the female will get inside the male's cave, or - he will allow her to enter his cave. He will keep her trapped inside the cave for as long as it takes the male to convince the female he will indeed be able to keep the eggs in the cave, and will be able to protect them. A consequence of this is that they need a tight fitting cave, or he will not be able to keep the female trapped in it - nor keep the eggs under control). The cave should be no wider than the fish's body + one pectoral fin extended, no higher than the fish body, and one and a half times the fish's body length in depth. 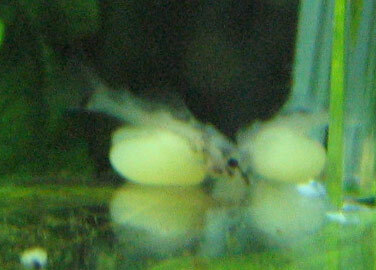 Once the female is ready the spawn can begin. The whole process can take from 24 hours to up to three days, depending on wether it is an experienced male or if it's a first time try. When a female has been trapped in the cave by the male for what might be days, and finally leaves, it could be very hard for the breeder to resist the temptation to check if the male is finally guarding eggs. If the temptation to do this proves too hard to resist, then the best way to check is to use a camera with a flash and take a picture. The Zebra shows very little reaction to the brief flash from a camera, maybe because it resembles lightning? Try to avoid shining into the cave with a flashlight as this will stress the male, his reaction will clearly indicate that he does not feel comfortable with the light. Do not under any circumstances point an infrared camera towards the cave! The Zebra can see infrared light, and will respond with a very strong stress reaction that might, as happened to me, cause the loss of an entire egg clutch. 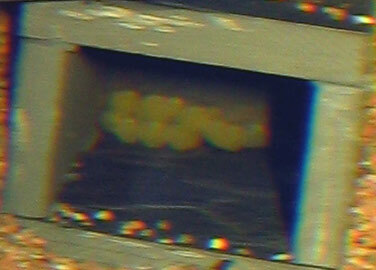 If the spawn is successful the egg clutch will consist of 5 to 20 eggs, and hatch after 5-8 days, depending on the temperature of the water. The male will guard them until the fry's yolk sack is used, which usually takes about 18 to 20 days, again depending on the temperature, 29C is good. 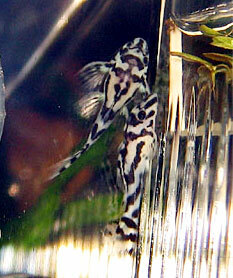 The fry develop very quickly, and are independent at the age of about 20 days. But from there on it takes a long time for the fry to grow. After a year they should be about 4-5cm long, and they are not sexually mature until they are about 3 years old. This is consistent with the biology of a fish that have a long life span, but can be taxing on the patience of the breeder! Even though this fish has a rather high trading price, thinking that breeding Zebra will be a moneymaker will result in disappointment. Leave the fry with the male if at all possible. The fry I have left with the male is today twice the size of the fry from the same spawn that I kept in a fry trap. It's unquestionably best for the fry to be left with the father. As soon as the egg yolk is used the fry will need to be fed. The fry will eat any protein based food as long as it's small enough. Crushed Tetra Discus, sinking tablets, finely chopped shrimp mix, crushed flake food, but NOT blood worms! There have been several occurences of fry choking on blood worms, which by the way can also happen with other foods if it's not fine enough. An important addition to the mainly protein based diet for the fry is vegetables. Feeding parboiled squash is ideal, as it also gives the fry an opportunity to use their teeth. It's commonly considered that the first spawn will be infertile. This is not my experience. The first spawn I had resulted in 3 wrigglers, but they did fall out of the cave prematurely. I caught the three wrigglers and put them in a fry trap, and I still have them today. I believe the first spawn will indeed often fail due to the males inexperienced to look after the eggs and fry properly, or he might not fertilize them, but fortunately the first attemt doesn't always fail. The fish is as of Jan 1, 2005 banned from exporting from Brazil, together with several other catfish. Expect another 3 or 4 years before they are readily available again, if it happens at all. In the meantime - let's do our best to breed them to keep the numbers up!